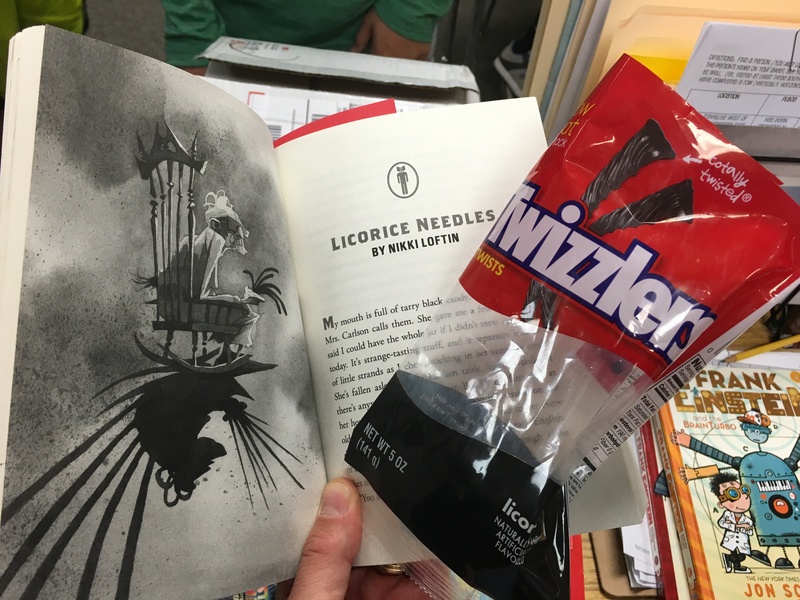 Over the past few days the 6th Grade Chapter of SMS Guys Read has been attacking the creepy story Licorice Needles by Nikki Loftin whilst eating black licorice from the Dollar Store. Licorice Needles is one of the short, scary stories in the new Guys Read Anthology: Terrifying Tales. When we were finished reading we decided to make a few videos detailing our thoughts on both the story and eating black licorice. So have you read any creepy stories this week. If not we highly recommend Terrifying Tales and Licorice Needles by Nikki Loftin. So we are in the week before All Hallow’s Eve (BTW go check out All Hallow’s Read right now) and the 6th Grade Chapter of SMS Guys Read decided to read one of the new Guys Read: Terrifying Tales entries. After I read the whole anthology I chose Licorice Needles by Nikki Loftin to read out loud to the lads. I will admit one reason I chose Licorice Needles is so I could offer black licorice to the guys as I read. I actually really like the taste of black licorice, but most of the guys gagged repeatedly as they attempted to chew the rope as I read. 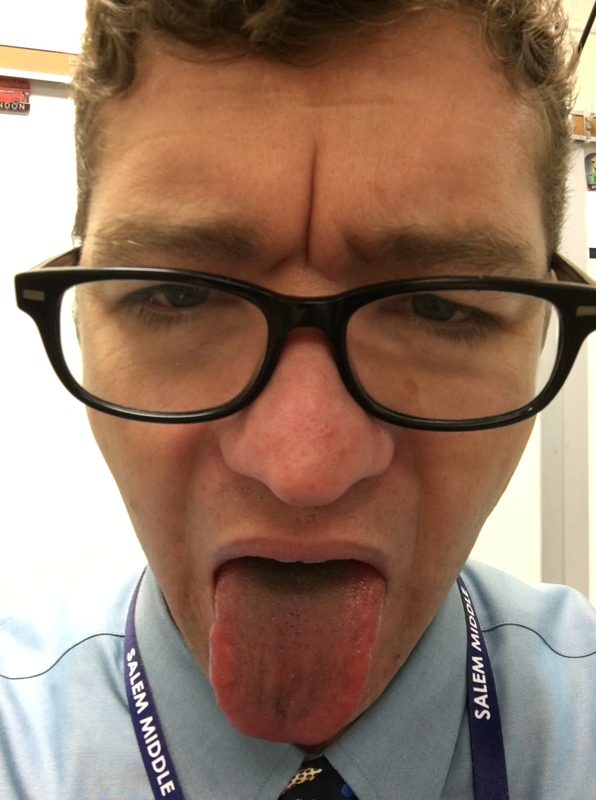 We are almost finished reading so check back in soon as the lads share some of their thoughts on black licorice and the story Licorice Needles. So it has been almost three weeks since we last had a meeting for Guys Read or The Inklings. Let’s get back in the habit shall we? Unfortunately I am going to have to cancel the 7/8th Grade Chapter of Guys Read meeting scheduled for Tuesday October 27. I have to take my children to the dentist, and I don’t think the lobby of Dr. Kelly’s office is quite ready for a Guys Read meeting. We are still working on reading The Iron Trial and will be doing some fun reading challenges dealing with wristbands, fungi meals and Gummi Worm attacks. Then we need to decide if we move on to Princess X? We might even try a few Spartan Time meetings as the quarter gets going. I finished the Guys Read Anthology: Terrifying Tales and we will be finishing October with a creepy story called Licorice Needles. We will still be working with Secret Coders and start to develop some Logo art that we can share with Gene Yang. Then we will start talking about Frank Einstein and his newest adventure with the human systems. 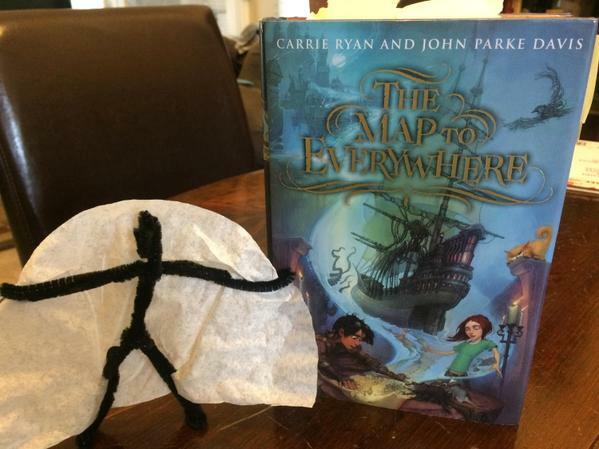 We are going to get into The Map to Everywhere and we have some really fun Reading Challenges planned, so get reading. So get reading and get ready for a great quarter of book club meetings!!! 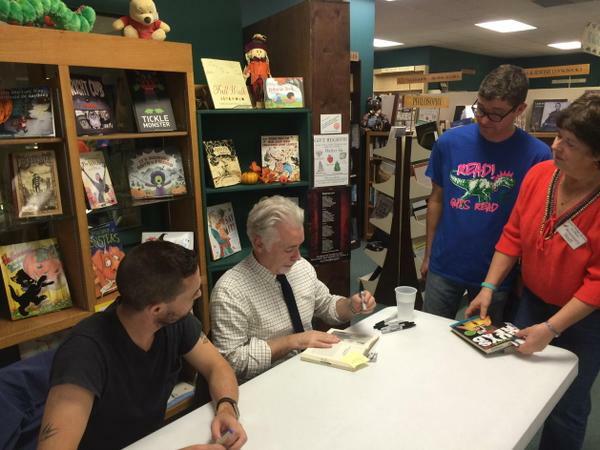 Last night a small exploratory group from the 6th Grade Chapter of SMS Guys Read ventured into greater Raleigh to view an author/illustrator as he presented on his latest work. 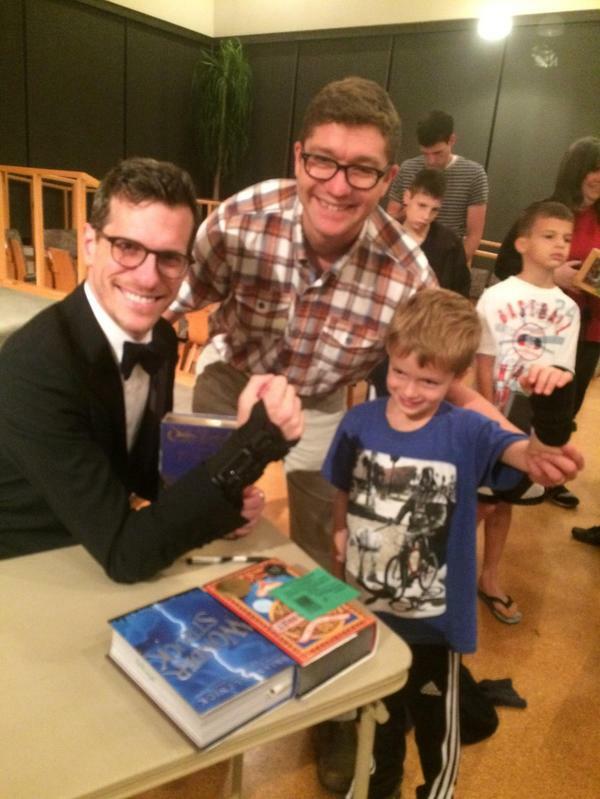 The author was the great Gene Luen Yang sharing stories of his life and writing and illustration ventures. If you have the chance to meet Mr. Yang I would highly recommend you drop everything and get there. He is very interesting, humble, brilliant and funny. 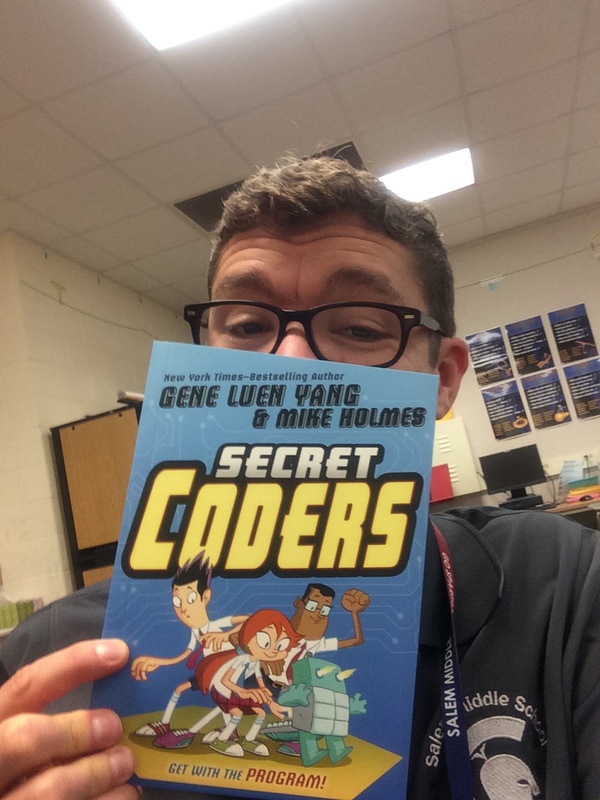 During Mr. Yang’s presentation he introduced us to some very interesting characters from his latest story, Secret Coders. Those characters are some strange little birds with a few extra facial parts. 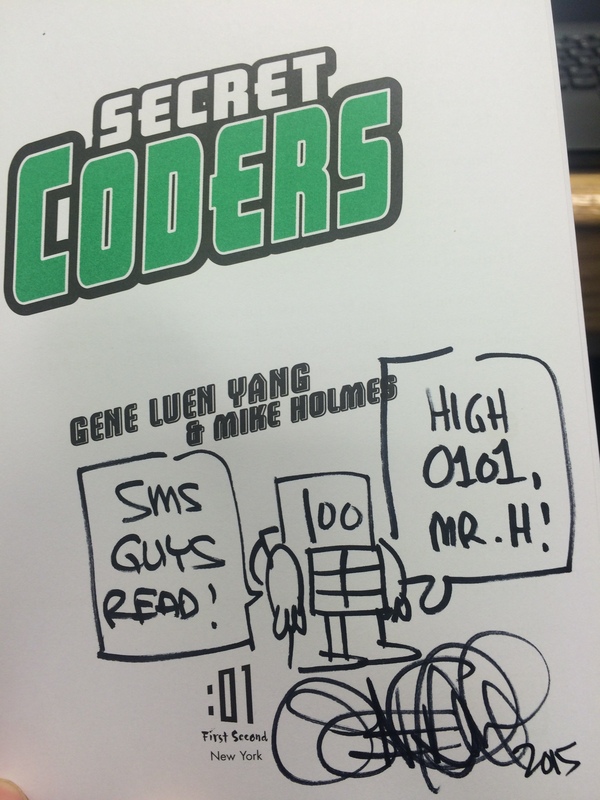 While introducing us to these odd little birds Mr. Yang secretly introduced us to binary numbers. One of our guys was even called up to solve a binary problem… I am pleased to report that SMS Guys Read took the shot and scored. The story of Secret Coders is all about the “magic” of coding and we have had some experiences with Logo Programming over here at SMS Guys Read, but I really feel like Seamus Finnigan when I try to get that little turtle of do what I want it to. When the talk was over we were able to meet Mr. Yang as he did a book signing. It was a great little visit and I really look forward to getting back to school, after our short fall track-out break, so we can talk more about Secret Coders and await the next episode. Maybe we can get a sneak peek, 2016 is a long ways away! PS. I also picked up this set about the Boxer Rebellion from Chinese history and can’t wait to finish them off.